“HIGH FIVE EVERYONE!” this is the ever repeating sound in our ears and mind after we experienced the mixed joy, excitement and thrill on the recently done Water Rafting, we in RPM, had experience as our first team building activity. 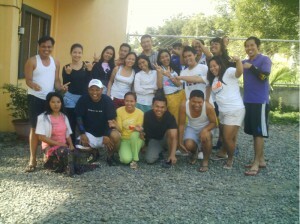 Just last Saturday, November 20, 2010, the office scheduled its water rafting activity with the White Water Rafting team, managed by Jerome Garcia. At 6:00 in the morning, we met in Gaston Park and had our time taking photos for our memoir on this said event; while waiting for the others to come. At 7:30, we went to the main site office for the orientation and for the packing of our things for safety. The staffs, guides and the management were good and prepared for the activity. They served us well, and safely. Professionalism is being observed, which made all of us feel the complete ease. Mr. Garcia pointed out to us the basic yet important things to remember, while we are on our way on the 21 rapids. The things, actions and the right options to do while we happened to stumble had been stressed and clearly stated. There are lots of hazards that will happen if ever we will miss to follow the warnings and orientation. After, unexplainable excitement and thrill filled our hearts and minds. But the adventure went on! There are other three companies of people who were with us in RPM realty. 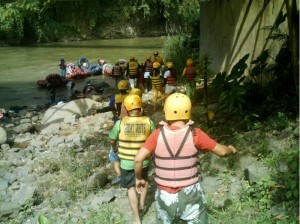 And there are two groups in rafting; the Pinoy and Western groups. 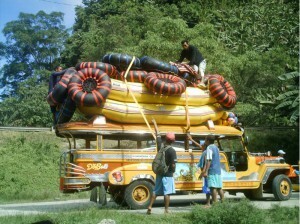 Most of us went to Pinoy – the tubing, and the others to western. We started are water adventure at about 10 in the morning following the very cold and longest river in Cagayan de Oro, up to the bridge where we jumped as our final thrill to experience and overcoming fears as well! The sun rays and heat never stopped us to experience the excitement we have, and the astonishment on our faces really shown, upon discovering the beauty of the entire river and the natural resources surrounding it. And while we are on our way, rocks, rapids and plus the other people with us, made us felt the total happiness and complete thrill ever before we reach each rapid! Very breathtaking, yes it is! Especially every time we stumble down, this would complete the term “Water Rafting”. It is part of the activity, to experience everything, if you will just enjoy the water flow, and will not experience to stumble down with your guide, it will not complete the rafting. Try it, and you will know the true feeling of how water rafting really is! At almost 1 o’clock in the afternoon, we went back to the White Water Rafting office for the lunch fellowship. All of us were tired, but the smiles, and shared thrill and amazement’s on our aura is visibly clear. Thanks to the White Water Rafting team for the good and safe guide and service!